NOTE: There's a BIGGER AND BETTER version available. Omega Modern is an improved remaster: check it out here. Take your game back in time to the modern era with the Old School Modern resource pack. 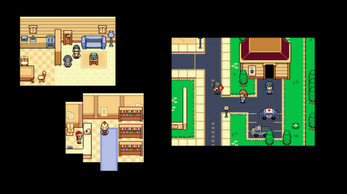 The crisp pixel-based style recalls games of the early console era, with fresh new tiles that provide limitless possibilities. Create towns and cities with modern homes, stores and office buildings. A variety of tiles provides everything you need to build the wilderness around your towns, including dungeons like caves, temples or a technology maze. And populate that world with all sorts of characters designed to fit in with style! Characters and matching battler graphics expands the possibilities offered by Old School pack. NPC characters fit into the modern world, playing roles that range from an army soldiers to football cheerleaders. Monsters come in classic varieties, from beasts and insects to vampires and zombies. 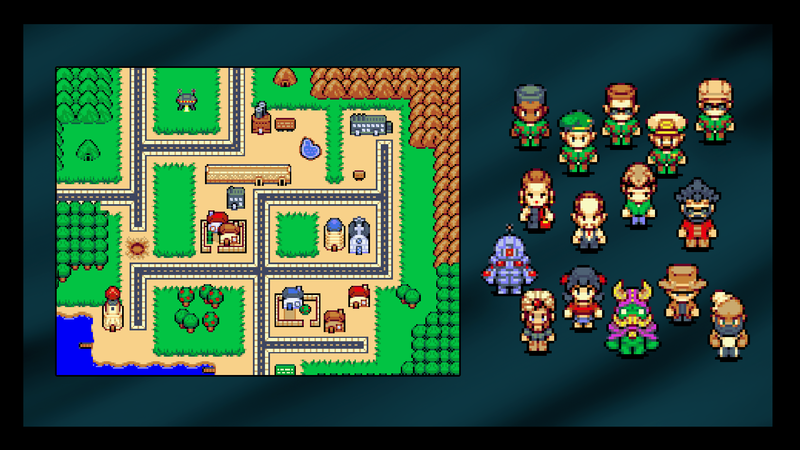 Note: The graphics in this pack were originally released in two separate RPG Maker DLC packs. 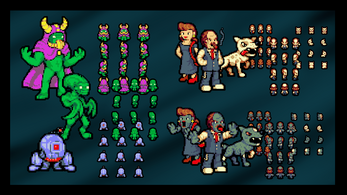 I've compiled all these assets here into a single pack for this release. Unlike the OSM packs on Steam, this "full version" of the Old School Modern pack is not restricted to use in any specific engine. 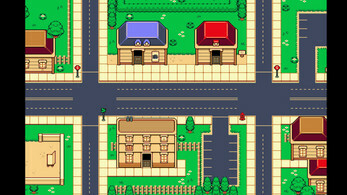 Additional animated sprites: vehicles, fish, treasure chests, doors. 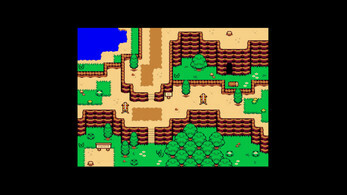 Tiles: interior and exterior tiles for modern towns and houses, wilderness: forest/mountain/caves/swamp, temple ruins, tech-dungeon and overworld. Yes you can sell games made with these. You can make games using any engine or for any system. You are free to edit these. You can't re-sell the graphics themselves. You can use them in any way and then sell anything that you use them in. Are you still planning to remaster this for 2019? Just wondering before I purchase. Thx. wow amazing can you post a screenshot or any example. I can't wait! 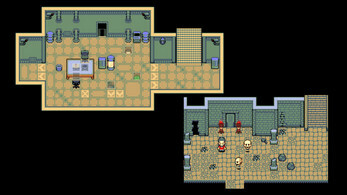 Is this for RPG Maker MV or for VX Ace? Also - do you do commissions? I'd love to get some custom characters built out. 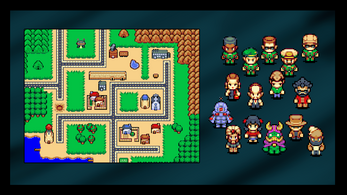 Would you say that this pack works well with your other projects, more specifically the 80+ Character Sprites? Does this include the Retro Halloween Tiles as well? No, those weren't made by me. They were made by someone else in the same style. Hi! Is it the same as what you sell at Unity Asset Store? 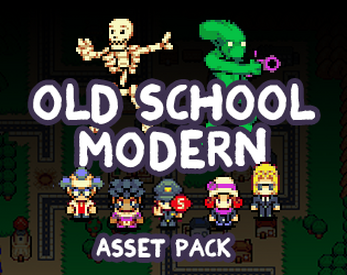 The Old School Modern pack in the Unity store is sold through a publisher. I don't have direct control over it,-- but it should have the same content, yes. Hi! Are you planning to make more resources that fits with this? I love it! hey, i need some modern soldiers, you can make some? Any plans to make more of this style tilesets? For Ex. seasons, more buildings, random indoor/outdoor items? That's great news. Will it be released here or on your Patreon? Do you have attacking animation for the characters? Not for these ones. 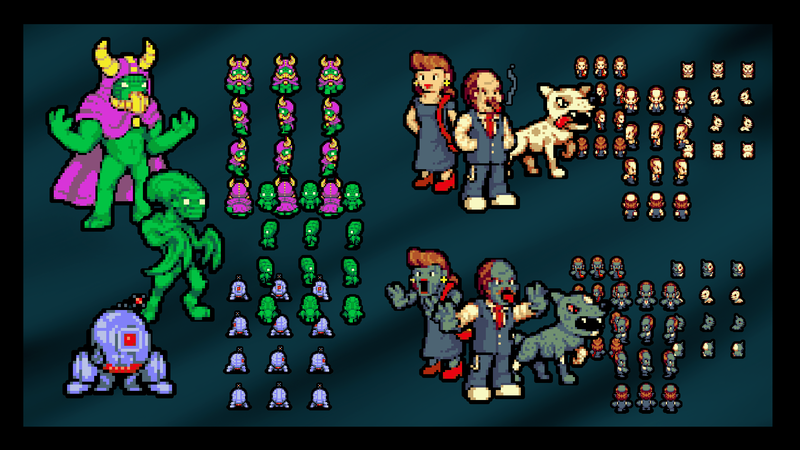 Just regular walking sprites. Can I use these graphics in RPG Maker MV? Hello, do I have to edit anything or it's perfect for use on RPG Maker MV? Thx! you just need to resize the characters about 150℅.The cars need to be mirrored and some other stuff. but if youre going to make a game for real this pack is worth any little adjustments it may need. Can you post some more map example pictures, i bought this here and i believe vx ace had map examples. i justwant to see pictures, for example i dont know how to tile the observatory. and i noticed the overworld theres a church, can i make that too using the tiles for a full sized church? I already have this on Steam for VX Ace. Does the "you can use it anywhere" still apply?